The north west of Malaysia has two well known islands, usually on the route of most backpackers: Penang and Langkawi. Each has its own style. Georgetown is much more developed than I expected. From what the guidebook was implying, I thought it would look like a much smaller town. It’s a quickly spreading city with a few high rises. The old town, that is to say Chinatown and Little India, do have a different vibe which I really liked. 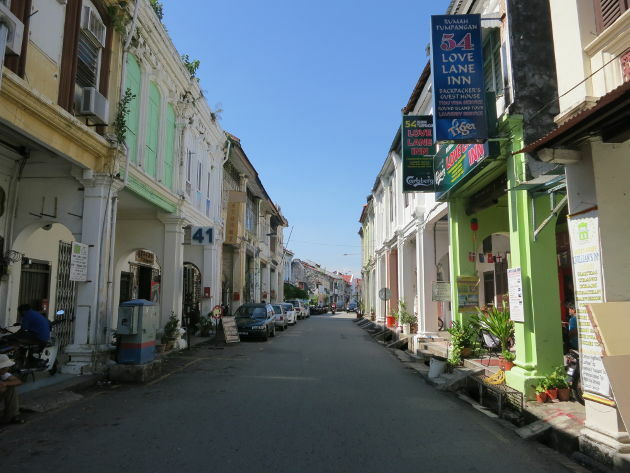 The streets have colonial era buildings, fewer cars and are full of small shops and cafés. I wanted to visit the National Park where the best beaches are supposed to be but my great luck stroked again and it was closed until further notice! I had rented a scooter especially to get there. It still allowed me to tour around the northern coast and visit the botanic garden. 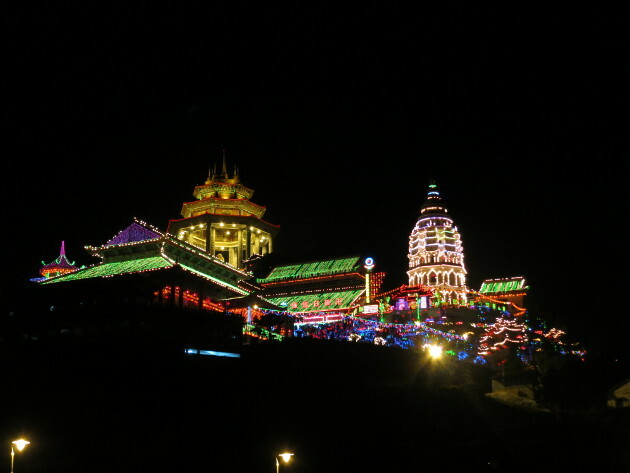 Penang has a few big temples and notably the largest Buddhist temple in Malaysia. It features a very large pagoda as well as a gigantic statue. I was lucky to be there for the only two weeks a year they illuminate the temple at night. A great experience. One of the highlight of my stay was baking a chocolate fondant at Jazz’s house, a local guy I met there. While the chocolate wasn’t strong enough, the taste wasn’t too far from the real thing! A 3h ferry ride took me to Langkawi where I stayed in Pantai Cenang. I didn’t do much there apart from a boat ride between islands which was not very sensational. The rest of my time was spent at the beach and going out in the evening. This was my last stop in Malaysia before heading to Thailand. Malaysia was a great place to travel. People are very friendly, accomodations are easy to find, cheap and clean, moving around is easy and there are many things to see. Unfortunately, it was not the good season to visit the east coast and I missed Melaka. I hadn’t plan to visit the Borneo part but it also seems very interesting. Malaysia should be a must see if you’re traveling through Southeast Asia.